Just like the similar component used in cars and trucks, boat alternators provide current that is generated and collected to use on demand as an alternative source of electricity. Onboard a ship or boat, marine alternators are attached to the engine, or to the propeller shaft. Alternators are simple machines with only two main parts: a stator and rotator. When an alternator is near the end of its service life these parts will malfunction. Here’s a simple test to check which of these parts is the likely culprit and likely requires replacement. There is a simple test to see if your alternator is working. Using the panel voltmeter, the reading should be 12 volts with the ignition on, but without the engine running. If you do not read a jump to 14 volts when you kick over the engine, alternator/regulator failure is usually the culprit. 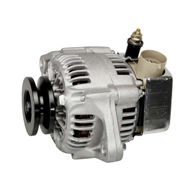 When you need a replacement boat alternator, come to Wholesale Marine. 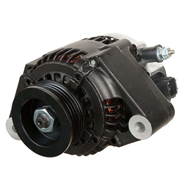 We have quality alternators and starters from Sierra for most makes and models. We know you do not want to miss a single day on the water, so we offer same day, flat-rate shipping. If you’re not sure which marine alternator’s your best choice, just use our handy parts locator, or give us a call for prompt and courteous service. We stock everything boaters need to keep their craft well-maintained and ready to launch. Once you become a Wholesale Marine customer, our selection, experience, and renowned customer service will keep you coming back. When you need advice about marine alternators or anything else for your boat, give us a call. Call us at (877) 388-2628 for same day, flat-rate shipping and our low price guarantee. We’re here from 9:00 AM until 6:00 PM, EST, Monday through Friday. Be sure to ask about our Captain’s Club Rewards Program for additional discounts every time you shop at Wholesale Marine.